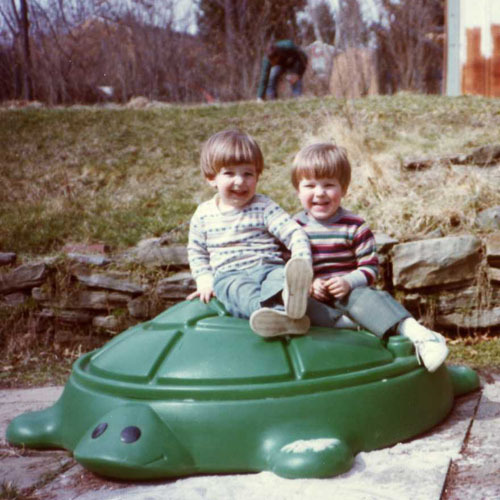 Jonas and I sitting on the back of a giant turtle. Jonas is two years old in this picture, and I'm almost four. When I was 20 months old, my younger brother Jonas was born. In a lot of ways, we’re similar. People in my family tend to be quiet and introverted. We both like to study things in great detail. But in other ways, our personalities have always been different. After my tumultuous first few months, Jonas seemed like the happiest baby ever; he was a lot calmer than I had been. This continued to hold true as we both grew. One day when I was three or four, Jonas and I were in a room with a door that had a mirror fastened to it (not very securely, as it turned out). Jonas grabbed the mirror, and it fell off the door, shattering with a loud crash! Mom came running to find Jonas standing nonchalantly by the door with a cut on his finger from the mirror, and me crying and shouting hysterically. “How many times have I told you not to do that?” I yelled at my brother again and again. The answer to that question was zero– I had never mentioned it before– but it was something I had heard people say when they were angry, and I was mad at Jonas for making such a loud noise and a big mess! It took longer to console me than it did to bandage Jonas’s hand. Most of the time, though, I think Jonas and I got along very well. It was a lot more fun playing and learning when I had someone to share the experiences with. Jonas grew faster than I did– it was very common for people to ask my parents if we were twins. I heard “No, they’re 20 months apart” so many times that I still often think of the age difference between us in months rather than years. As we grew, Jonas tended to be more adventuresome and willing to try new things than I was. He was usually the first to try an unfamiliar kind of food or a new activity. In some ways, I suppose, he has been like a big brother to me, though he has never looked down on me as if I were a little brother. Looking back now, I think there are a lot of experiences I wouldn’t have gotten the chance to enjoy if Jonas hadn’t been there to get me to try them. You see, my father was a pediatrician, and my mother was a nurse, both of them very smart, caring people who had taken care of many children. They always knew what to do when my brothers and I would get hurt or sick. My mother has told me that I cried a lot. All babies cry a lot, of course– what else is there to do?, but I cried a lot even for a baby. Apparently, I was often uncomfortable. My skin was easily irritated. In general, I was overly sensitive– a description that would fit me all my life. My mom would hold me for hours, trying to get me to stop crying. At times, she was in tears, wondering how, with all of her training and experience as a nurse, she could seemingly calm any baby but this one. 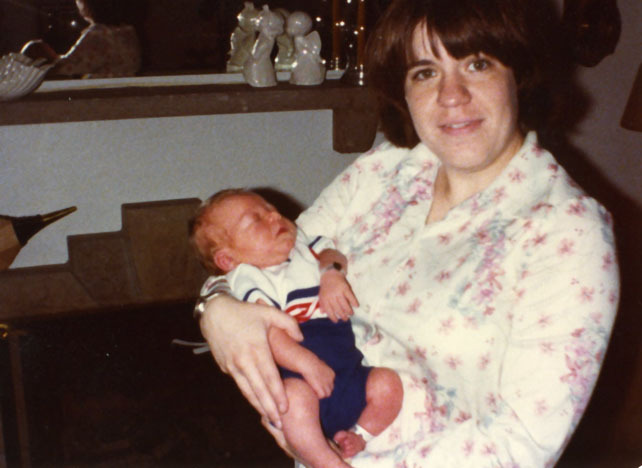 I have no idea if my restlessness as an infant had any connection to Asperger’s (a term that hadn’t even been coined yet). I did find it interesting to read of a similar experience in Daniel Tammet’s autobiography, Born on a Blue Day. Tammet is autistic and experiences vivid synesthesia (perceiving things like words, numbers, and days as having colors and shapes). When he was a baby, Daniel cried at all hours of the day, and his parents would calm him by making a sort of hammock out of a blanket and swinging it back and forth, each of them holding one end. It does make sense to me that a baby with autism might experience the world with more sensitivity and take a longer time to adjust to that than a non-autistic baby, but I don’t have any real evidence to back that up. I would imagine that experiences vary quite a bit depending on the individual. But whatever the case, I am so thankful for my mother’s patient love. Before I was even aware, I was loved unconditionally by my parents. I think that my parents have been the most powerful testimony in my life about the love of God. It’s because of that reflection that I have a concept of what God’s love is in a world that usually doesn’t reflect it clearly. It’s why I can have hope even in the most painful or distressing times that all along, I have been resting in the arms of my heavenly Father.